Great for the horse lover in your life! This piece pictured and priced here in Sterling Silver. 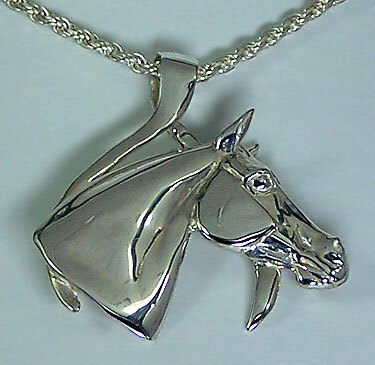 Horse Head in Wishbone Pendant JET6601SS, this piece is a horse that could be several different breeds. The wishbone frame adds elegance and enhances the piece, making it truely unique. This piece pictured and priced here in Sterling Silver. This piece and others available in 14kt yellow gold, and 14kt white gold.